Scheduled gaming sign up is open! Games will be being added regularly until the convention starts! We have started adding games and will constantly be adding games up until the convention, so check the schedule regularly. You can sign up now! You will need to have an account on tabletop.events and purchase a RAGECON badge in order to sign up for games. Already have a Tabletop Events account? You do not need to sign up again, just purchase your badge at the RAGECON page! When signing up for a scheduled game almost all games are free but the buy action is how you add a game to your schedule. How to sign up for scheduled gaming! Log in to your tabletop.events account and go to RAGECON 2019. Choose “Attend” on the menu and select “Events Schedule”. This will take you to the current gaming schedule. Browse the schedule and click the “Get” button on the game you are interested in signing up for. On the right you will see a button that says “Get ticket for [YOUR BADGE NAME]”. Click that and the game will be added to your cart. Go back to the schedule and add any other games you would like to play in the same way. When you have added all the games you would like to play, simply go to your cart and hit the “Check Out For Free” button and you will be signed up! The games will be under your “My Schedule” (Make sure you click your badge to view!) if you need to make any changes. Don't want to sign up for games? 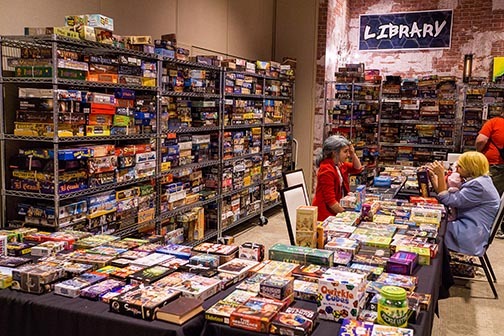 You can also check out games to play from our massive game library! Do you want to run your favorite game at RAGECON? We need Game Masters (GMs) that want to run games during the convention! 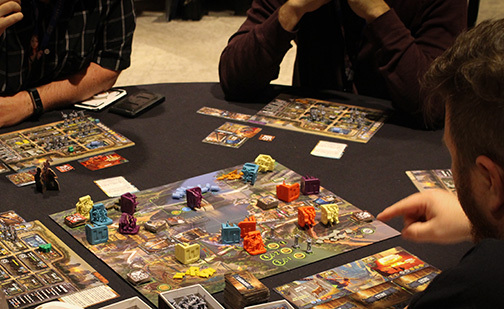 Game Masters (GMs) qualify as Volunteers and get discounted admission for running games. Totals hours volunteered do not have to be consecutive. GM’s need to attend at least one training session before the convention. GM training sessions will be emailed to you once approved as a GM. The training will provide you all the information you will need to check in players to the game(s) you are running at RAGECON. TABLETOP.EVENTS is the registration and event scheduling system we use for the convention. Please create an account there then the system will allow you to create game events, that once approved, will be added to the schedule. GM’s will be given a separate link for registering that is not visible on the TABLETOP.EVENTS site so please wait to register for you convention Badge. Once your games are approved you will get a link for registering that will have the GM registration options and discounts avilable. If you would like to register for the VIG (Very Important Gamer) package this option will not provide any further discounts for GM’s as the VIG package is already discounted and does include all the swag goodies! Feel free to provide the following information to the Event Coordinator at the email address below and we can add your game to the system for you, although it is very easy to submit your games on TABLETOP. EVENTS yourself. The system has you select all the information below when requesting a game to run. You will still need to register at TABLETOP.EVENTS for us to assign you as the GM or submit them yourself. Name of game you would like to run. Date and Time you would like to run the game.